There have been many time travel movies and TV shows I’ve enjoyed. “Doctor Who” “The Time Tunnel” “Voyagers!” “Back To The Future” “The Time Machine” “Bill and Ted’s Excellent Adventure” “Seven Days” “Life On Mars” “Time After Time” “Time Bandits” But my favorite time travelers are without a doubt MR. PEABODY & SHERMAN. I loved the “Rocky & Bullwinkle” show as a kid and the “Mr. Peabody’s Improbable History” episodes were a particular favorite of mine. 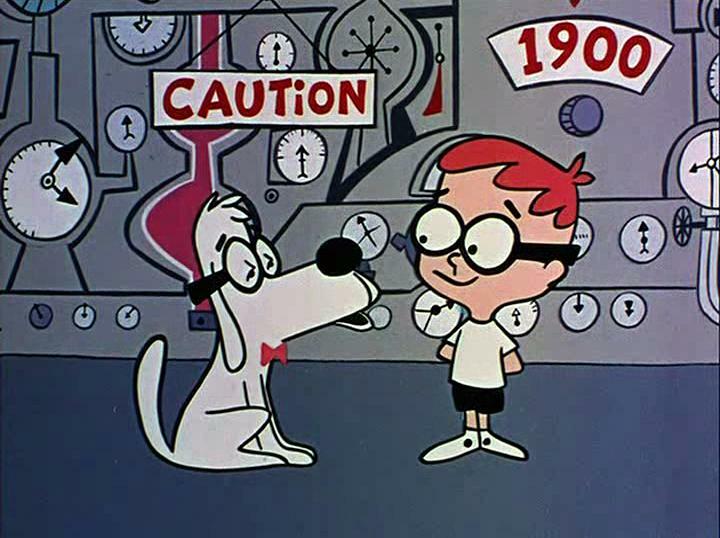 Highly entertaining and educational, each episode would see Mr. Peabody and Sherman going back to some pivotal moment in history via The Wayback Machine, a time travel machine invented by the hyper-intelligent Mr. Peabody. The Wayback would transport Mr. Peabody and Sherman to Washington’s crossing the Delaware or Benjamin Franklin flying a kite attempting to discover electricity or Alexander Graham Bell about to make his first phone call. 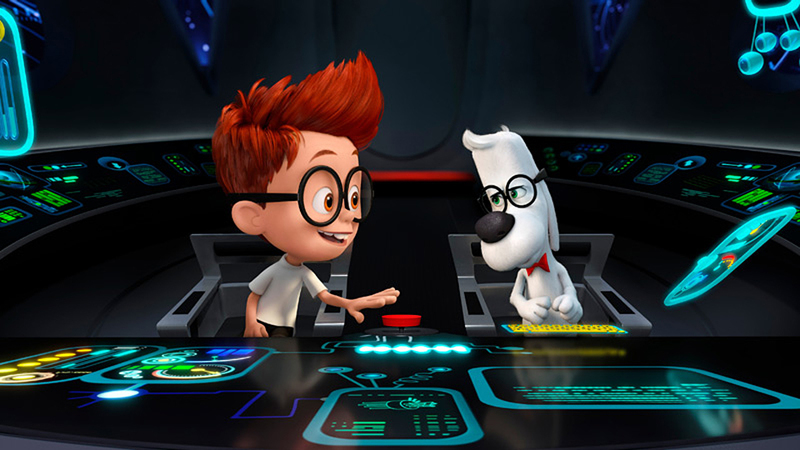 Something would always go wrong and it was up to Mr. Peabody with the capable assistance of Sherman to make sure that history played out the way it was supposed to. Every episode would always end with Mr. Peabody making some kind horrible pun that always was rewarded with a groan and face palm from Sherman. The full length movie MR. PEABODY & SHERMAN necessarily has to put a lot of meat on the bare bones of those short seven minute cartoons to fill out 90 minutes but thankfully it manages to stay true to the spirit of the characters and the premise. Mr. Peabody (Ty Burrell) is still a hyper-intelligent talking dog who wears glasses and a red bow tie. Mr. Peabody is a business tycoon, scientific genius, Presidential advisor, Nobel laureate, expert swordsdog, martial artist and gourmet chef. But he’s still lacking something in his life. Despite his accomplishments, he’s lonely. He finds an orphan baby named Sherman (Max Charles) and decided to adopt him, his argument being that if a boy can adopt a dog, why can’t a dog adopt a boy? I though it charming that never once does MR. PEABODY & SHERMAN stop to explain why Mr. Peabody can talk, walk on his hind legs and is apparently the smartest being on the planet but it takes a considerable amount of time to clarify the relationship between him and Sherman and indeed, most of the movie explores their lives in a way that the animated episodes simply didn’t have time for. The plot kicks in when Sherman has to start attending public school. Naturally Sherman’s having been home schooled by Mr. Peabody for seven years and taking numerous trips into the past via The Wayback Machine has given him a distinct advantage over the other students and earns him the wrath of classmate Penny Peterson (Ariel Winter) Penny’s horrendous bullying of Sherman provokes him into biting her and calling into question Mr. Peabody’s fitness to parent a human boy. Mr. Peabody invites the Petersons (Stephen Colbert and Leslie Mann) over for dinner along with Mrs. Grunion (Allison Janney) of the Children’s Services so that they can all resolve the situation amicably. Sherman is left to entertain Penny and once again he is provoked by her to the point where he takes her for a joyride in The Wayback Machine to impress her. This sets off a chain of increasingly wild and dangerous adventures in Ancient Egypt, The Trojan War and other periods of history that lead up to a disruption in the space time continuum and the possible destruction of time itself unless Mr. Peabody and Sherman can put time back the way it was. There are some minor changes to the original story of how Mr. Peabody and Sherman met but I didn’t mind as I understand where the screenplay was going with this and the movie emphasizes the relationship between dog and boy to go for an emotionally satisfying conclusion to compliment the last ditch effort to save the world ending and I didn’t mind because the final lines spoken by Mr. Peabody and Sherman to each other put a big grin on my face and any movie that does that is okay by me. The characterization of Mr. Peabody is tweaked a bit here as he’s not as arrogant and condescending as he is in the cartoons. Sherman is still the same sweet kid he always was, totally devoted to his “dad” and living an incredibly extraordinary life with a level head and unshakable optimism. In fact, there’s only two times in the movie when he’s truly scared and worried and one of those times is when he thinks he’s going to be taken away from Mr. Peabody. But the character of Penny Peterson is highly distasteful. A sadistic, severely disturbed brat with a destructive streak as wide as the West Side Highway, she’s one of the creepiest characters I’ve ever seen in an animated movie. To give the screenplay credit, it doesn’t cop out by making Penny just another misunderstood kid who would change her ways if somebody just gave her a hug. Nah, this kid is The Bad Seed, trust me. 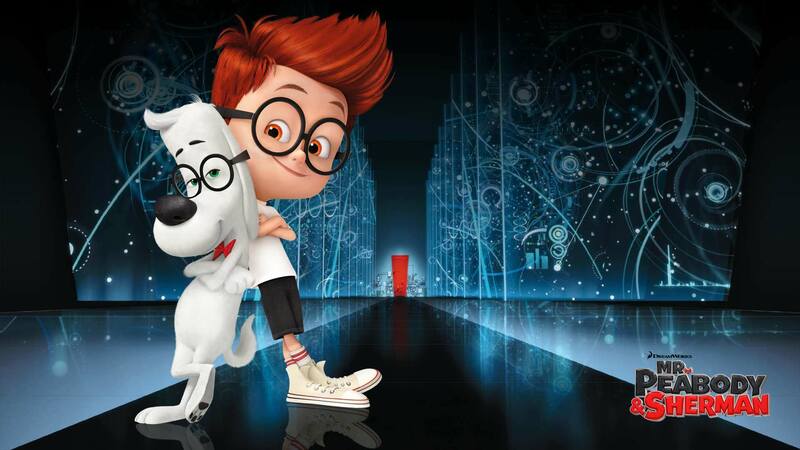 So should you see MR. PEABODY & SHERMAN? If you’re a fan of the original cartoons you should definitely enjoy it. And if you’ve never seen those cartoons, don’t let that stop you. The biggest change here is that The Wayback Machine is now an actual time machine Mr. Peabody & Sherman travel in instead of a doorway they simply step through but again, I understand why it was done and as I said earlier, as long as the spirit of the original is maintained, I’m along for the ride. And what a fun ride it is. Highly Recommended.